The original upset stomach and diarrhea reliever with a hint of a fresh wintergreen taste. 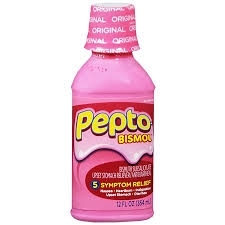 Pepto-Bismol Upset Stomach Reliever/Anti-Diarrheal Liquid relieves diarrhea and upset stomach due to overindulgence in food and drink, including heartburn, indigestion, nausea, gas, belching and fullness. Pepto has got you covered. Shake well before use. Use dose cup or tablespoon (TBSP). Adults and children 12 years and over: 1 dose (30 mL or 2 TBSP) every 1/2 to 1 hour as needed. Do not exceed 8 doses (240 mL or 16 TBSP) in 24 hours. Use until diarrhea stops, but not more than 2 days. Children under 12 years: Ask a doctor. Drink plenty of clear fluids to help prevent dehydration caused by diarrhea.